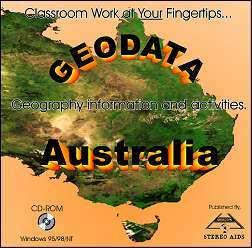 Geodata - Australia: Stereo Aids - Publishers of educational software and broadsheets. Geodata Australia contains a wealth of recent information on Australia in various formats including Graphs, Maps, Photographs, Tabulated Data and Text Files that can form the basis for any Australian studies program. There are prepared activities written by practicing teachers that are outcomes based from the national profiles. They have been written to cater for a range of age groups and levels of difficulty, from low order to higher order geographic skills.